Chinese New Year…with a twist! Our latest guest contributor is local Chinese food guru Nathan Fong, who kicks off Chinese New Year by offering us three unique recipes for the season; an salad appetizer featuring lime ginger mint herbal tea poached chicken, a main of green tea spice rubbed salmon, and a tea poached winter pear dessert—all with a bit of a twist. Food and tea play an important role in Chinese culture, and are particularly symbolic during Chinese New Year celebrations. Here are three recipes that combine both the goodness of tea with the nutrition of food, and are health-conscious dishes that would be a prefect addition to any Chinese New Years celebration. Cooking with tea has been an important technique in Asia for centuries, and smoking or poaching ingredients with tea gives dishes a delicate and aromatic flavor to them. To find out where you can purchase the teas I’ve used in these recipes, please visit www.transherb.com. Chicken is always featured during Chinese New year as it represents the symbolic Phoenix. The Lime Ginger Mint Herbal Tea is added to chicken stock and chicken is slowly poached to infused its delicate flavor and aroma. The Wild Berry Herbal tea is infused with both apple cider and juice to make a fruit scented vinaigrette. 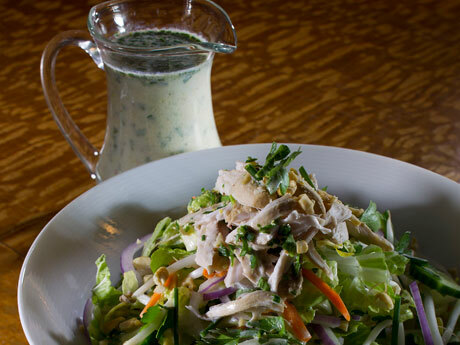 The Asian style salad, made up of fresh herbs and Chinese cabbage tossed with the buttermilk and tea infused dressing is a perfect match of East meets West fusion style. In a small saucepan, bring the apple juice and cider to a boil. Add the tea sachets and let steep for 5 minutes. Remove and pour into a bowl and allow to cool. Whisk together the mustard, olive oil and buttermilk, then gradually whisk in the tea infused juice-cider mixture and chopped herbs. Season to taste. In a saucepan, bring the chicken stock, soy sauce and ginger to a boil. Add the tea sachets and let steep for 5 minutes. Remove sachets, bring infused stock back to a boil. Add chicken breasts and bring back to boiling. Cover and turn off heat and let sit for 20 to 25 minutes, or until juices run clear when poked in the middle of the breast with a knife. Remove breasts and allow to cool. Reserve infused stock for another use such as soup. Shred by hand or slice chicken into julienne. Place red onion, bean sprouts, celery, cucumber, cabbage, cilantro and mint into a large mixing bowl. Pour half of the dressing onto the salad and toss, seasoning to taste. Place on serving dishes, garnish with chicken and chopped nuts. (Serves 4). Nathan has been an award-winning food stylist for print and film advertising for the past 24 years and is an internationally published food and travel journalist. He currently is celebrating his 21st year on Global BCTV News with his Saturday Chefs and Fong on Food segments, and has been a regular contributor to Canada’s public radio network, CBC Radio One as well as a food columnist for The Vancouver Sun and regular contributor to Taste Magazine and EAT Magazine. In addition he has worked for Enroute, Bon Appetit, Fine Cooking, Cooking Light, Men’s Health UK, Cooking Light and NUVO. His other television segments have included working with NBC’s The Today Show during the 2010 Winter Olympics, BBC and Sky Television, The Discovery Channel, both from England as well as the Food Network, USA and Canada, and New Zealand and Japan TV. He received the silver medal for the 2009 Food Network Challenge in the Superstar Foodstylist Competition. In 2002 he was selected as one of the “Top 10 Food Trend-setters of the Future in Canada” by the Canadian national newspaper, The Globe and Mail Newspaper and was the recipient of the inaugural IACP/Julia Child Award of Excellence for food styling in 1998. In 2006 he was nominated for the national Gemini Awards (Humanitarian) for his dedicated work with the Dr. Peter Centre, the Vancouver hospice for people living with HIV and AIDS.